He still needs Senate confirmation, but the rumors were true. Today at the White House, President Barack Obama announced his intent to nominate Daniel Rooney as the Ambassador to Ireland. Dan Rooney is the recent recipient of the American Ireland Fund’s Lifetime Achievement Award and honorary Commander of the British Empire for contributions to peace and reconciliation in Northern Ireland, has played an integral role in the Irish peace process since the early 1970s. In 1976, Rooney co-founded the American Ireland Fund, an organization which to date has raised over $300 million for peace and education programs in Ireland. Rooney founded the annual prize for Irish Literature in 1987 and co-founded the Ireland Institution of Pittsburgh in 1989. If Mr. Rooney is confirmed, he would be the 30th US ambassador to Ireland (where all but one were political appointees). 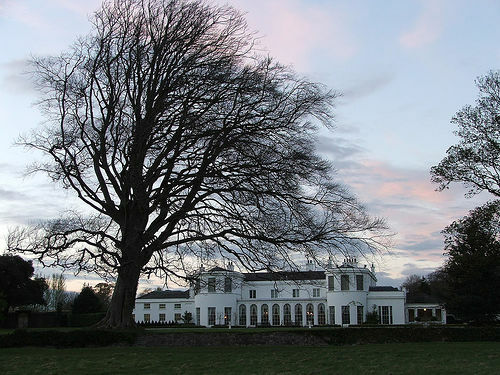 He might also be pleased to know that Deerfield House, his new residence in Phoenix Park had just been restored by his predecessor, Ambassador Thomas C. Foley. You know, I just realized that the American Embassy in Dublin was completed in 1964. That’s a 45 year old building — may be showing its age, too. The good news is — the shortest wait between application and issuance of passport was 4 days!! The bad news is, and you won’t like this — the passports were genuine but the supporting documents used to apply for these passports were counterfeit. That and one undercover investigator was able to obtain four passports under four different names! Ouch! A genuine U.S. passport is a vital document, permitting its owner to travel freely in and out of the United States, prove U.S. citizenship, obtain further identification documents, and set up bank accounts, among other things. Unfortunately, a terrorist or other criminal could take advantage of these benefits by fraudulently obtaining a genuine U.S. passport from the Department of State (State). There are many ways that malicious individuals could fraudulently obtain a genuine U.S. passport, including stealing an American citizen’s identity and counterfeiting or fraudulently obtaining identification or citizenship documents to meet State requirements. GAO was asked to proactively test the effectiveness of State’s passport issuance process to determine whether the process is vulnerable to fraud. To do so, GAO designed four test scenarios that simulated the actions of a malicious individual who had access to an American citizen’s personal identity information. GAO created counterfeit documents for four fictitious or deceased individuals using off-the-shelf, commercially available hardware, software, and materials. An undercover GAO investigator then applied for passports at three United States Postal Service (USPS) locations and a State Department-run passport office. The GAO investigator was easily able to obtain four genuine U.S. passports using counterfeit or fraudulently obtained documents. In their most egregious case, the GAO investigator obtained a U.S. passport using counterfeit documents and the SSN of a man who died in 1965. In another case, their undercover investigator obtained a U.S. passport using counterfeit documents and the genuine SSN of a fictitious 5-year-old child—even though his counterfeit documents and application indicated he was 53 years old. GAO states that State and USPS employees did not identify their documents as counterfeit in any of their four tests. GAO acknowledged that although it doesn’t know what checks, if any, State performed when approving their fraudulent applications, it issued a genuine U.S. passport in each case. All four passports were issued to the same GAO investigator, under four different names. GAO notes that the State Department operates 17 domestic passport-issuing offices, where most passports are issued each year. These offices are located in Aurora, Colorado; Boston; Charleston, South Carolina; Chicago; Honolulu; Houston; Los Angeles; Miami; New Orleans; New York; Norwalk, Connecticut; Philadelphia; Portsmouth, New Hampshire; San Francisco; Seattle; and 2 offices in Washington, D.C.—a regional passport agency and a special issuance agency that handles official U.S. government and diplomatic passports. Fifteen of these offices are regional passport agencies that process in-person applications in addition to applications received by mail. The remaining 2 facilities—Charleston, South Carolina, and Portsmouth, New Hampshire—are mega-processing centers with no access to the public. GAO reports that they briefed State Department officials on the results of their investigation. “They agreed that our findings expose a major vulnerability in State’s passport issuance process. According to State officials, the department’s ability to verify the information submitted as part of a passport application is hampered by limitations to its information sharing and data access with other agencies at the federal and state levels. They said that some federal agencies limit State’s access to their records due to privacy concerns or the fact that State is not a law enforcement agency. In addition, they said that State does not currently have the ability to conduct real-time verification of the authenticity of birth certificates presented by passport applicants. They added that birth certificates present an exceptional challenge to fraud detection efforts, as there are currently thousands of different acceptable formats for birth certificates. Further, they indicated that there are difficulties with verifying the authenticity of drivers’ licenses. Moreover, they said that although State attempts to verify SSN information submitted on passport applications on a daily basis with SSA, the results of this datasharing process are imperfect. Update 3/18: This made it to the Daily Press Briefing here. MR. WOOD: Yeah, we certainly have seen the report, and clearly there were some errors made with regard to these particular four passports. We’re going to make sure that this type of thing doesn’t happen again, which will mean putting in place a process – better processes for ensuring that, you know, that passports are provided – that are accurate, up-to-date, and you know – yeah. QUESTION: But you’re just saying those four. I mean, is there a broader issue here of compromising other passports? MR. WOOD: Not that I’m aware of. This was just – I believe the report was focused on – I think it was four individuals who were kind of operating under – for the GAO who were able to obtain passports with faulty information. And what I’m saying is that the Department is working on trying to put in place procedures to make sure that that type of thing does not happen again. One individual, four passports! Man, please read the one page summary next time!